For many years I have surfed on the Net to keep me informed about the actuality of embroidery in France. I often saw the name of Carole Magne. I urged to finally meet up Carole. Her specialties are White Work, Tambour Work (hook of Lunéville), Gold Work and other traditional techniques. I meet her at the boutique Des fils et une aiguille (Many Threads and One Needle) on Chabanais Street, near the palace of Louvre. Here is her story: at a certain point in her life, Carole Magne reoriented her career. She studied for two years in the high school Octave-Feuillet, where she learned many techniques of embroidery. 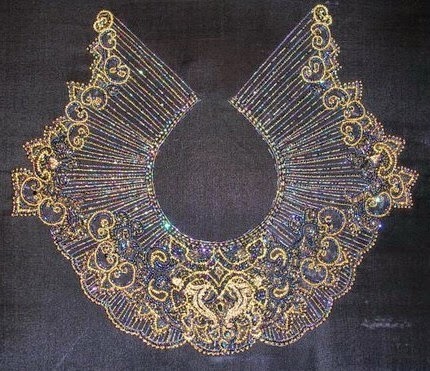 The second year was almost exclusively focused on Tambour Work, which is very useful to stitch beads and sequins in Haute Couture production. In fact, the students of Octave-Feuillet school are educated to work in Haute Couture workshops. Her promotion was constituted of 10 grownups and 22 young adults (17 – 18 years old). In 2013 (10 years later) Carole Magne is the only one who still makes a living from embroidery. She founded her own company, teaches classes, designs embroidered jewels and participates to handcraft fairs. Carole tells me, even if there are only a few professional embroiderers in France, there is no collaboration and friendship among them, only harsh competition. Carole has a faithful feminine clientele, whom ask constantly new designs, new classes and new projects. One of the difficulties she encounters in her field of work is the procurement of a variety of materials. There are only a few vendors whom sell the same stock over and over. If she is annoyed by the lack of variety in France, I don’t know what she would think of the availability and variety of material in Canada! Carole Magne observes that there is a coming back of the art of embroidery in her country. In the 80’s it had been almost extinguished. But there is a fluctuation for the specific technique in fashion. Nowadays, knitting and Crochet are very popular. Hopefully, knitting, as a contender for embroidery, is also a form of handicraft. Everything isn’t lost. At the far end of the Gardens of Tuileries, near the gigantic Egyptian obelisk (that Napoleon brought back from war) stands the Orangerie. That building was built as an orange tree green house for winter season. At the present time this is the home of Claude Monet’s masterpiece The Nympheas. I wanted to see that painting for many years. What a wonder! I am truly moved. The Nympheas occupy two immense oblong halls of exhibition and is divided in 8 sections. The ensemble recalls the hours of the day, from morning in the East part till evening in the West part. In those paintings Monet doesn’t illustrate the horizon. The sky, the air, the water, the ground are melted in a painting composition without perspective at the rhythm of the water lilies (the nympheas in question). The painter gives the illusion of a whole ambiance without an end, a wave without a horizon or a riverbank. Claude Monet took the last 10 years of his life to paint this piece. It seems to be the artist’s legacy. At the time he was already a famous painter. He hadn’t to prove anything to anyone. He painted freely with all his genius and his capacity of still having a heart’s child, marveled by the water of the pond near his home. 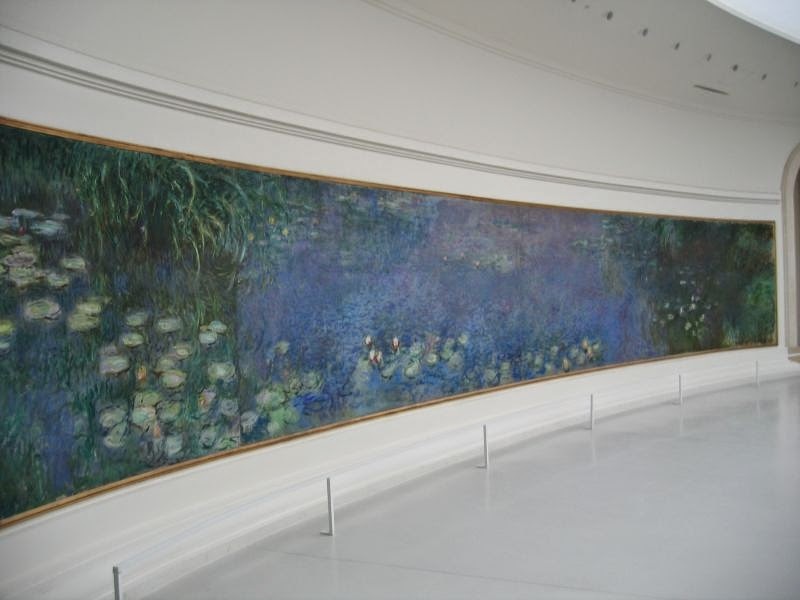 Monet himself did specifically want the Orangerie (an empty building at that moment) to be the exhibition room for this painting. He had envisioned precisely the way to show off the painting, but only after his death. He died in 1926. The museum of the Orangerie was inaugurated in 1927. 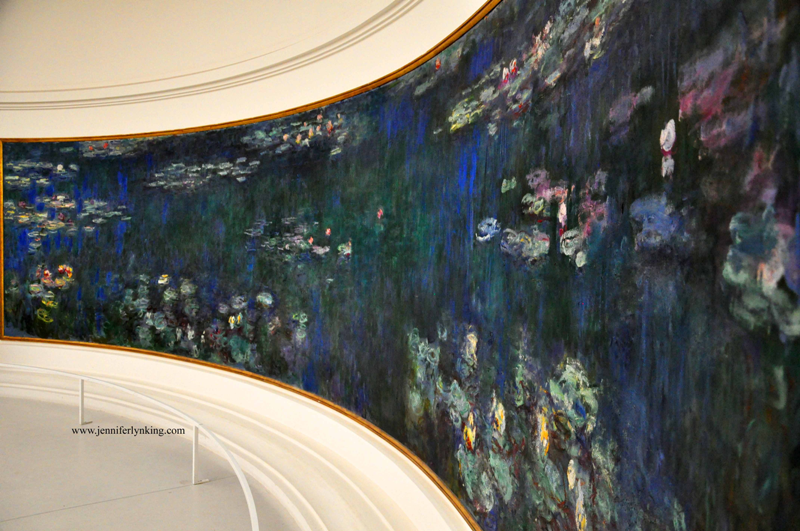 That was Monet’s gift to the Parisian citizens. Because he lived through the First World War, he wanted to create an asylum of peace, as he had his own asylum in his garden of Giverny. In 1927, the visitors and the art critics didn’t understand and didn't appreciate this out of standard painting. By its characteristics, the Nympheas determined the basics of Abstract Art. At long last nowadays, the public reacts differently: Claude Monet wins his bet to gain affection, consideration and admiration for his Nympheas. The way to reach Deneth’s apartment at Cité international des Arts is really tortuous: an inside courtyard, an arch, a stone paved path, a long corridor... The ensemble is a puzzle of old historic houses imbedded in more recent buildings, trying to respect the architectural style of the 4th borough. I decide to follow the noise of chatting to choose the appropriate stairs. Up there is a big bash to welcome me. Appetizers, music and dozens of people admiring the colorful accessories and clothes designed by Deneth. She smiles widely, full of life, breathing the joy of life. 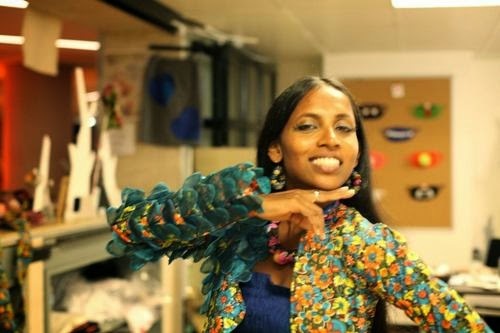 Deneth’s company is a family story: her parents, her sister and her uncle work with her and the business is flourishing. 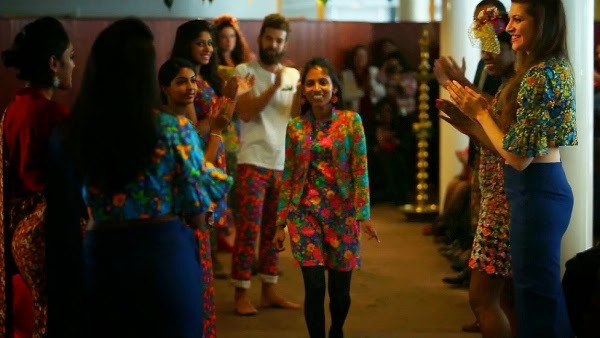 Deneth’s clothes are made from the cheerful traditional cotton of Sri Lanka. The motifs of the fabric are typical of the peasants. 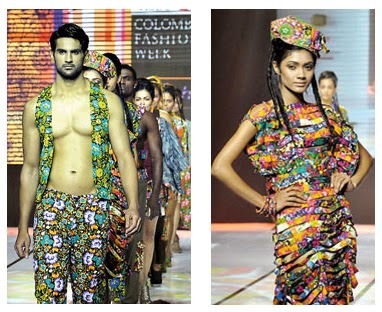 But this kind of fabric isn’t fashionable in her country. On the contrary, in the cities those motifs and colors are simply snubbed. Deneth’s challenge consists in demonstrating what is traditional can also be in fashion in the sophisticated Paris, capital of Haute Couture. Last Sunday, while I was stitching, I heard a strange noise in the street. In fact, that was the lack of traffic noise that puzzled me. 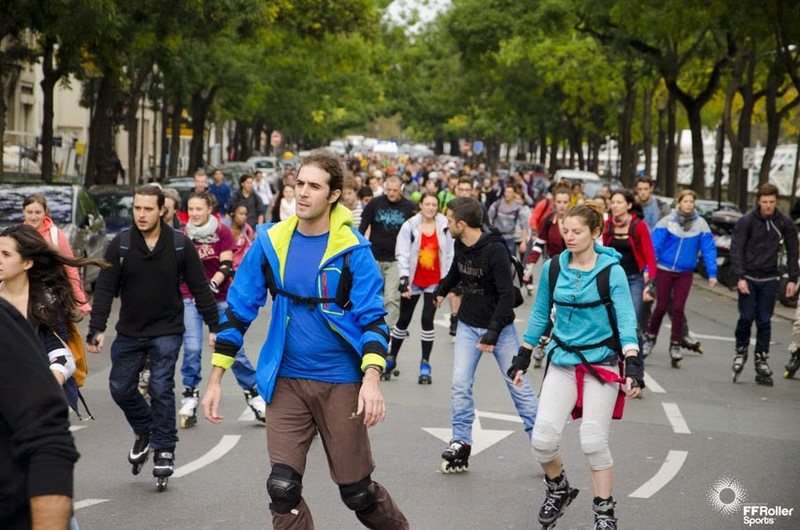 Instead thousands of roller skaters were hitting the road. The sound was so different, a flow of muffled noise. What an amazing spectacle: the crowd was colorful and fast, everybody was heading toward the same destination. A true melting pot of every kind of skaters: young people and not so young people; last fashion roller blades beside old things on wheels; pro skaters slaloming to the left, to the right and not talented skaters at all, in need of a partner’s hand for equilibrium; skaters with or without an helmet; some in shiny Lycra suits; and at the end of the parade, policemen in their cars followed by volunteers in yellow t-shirts. The name of this event: Rollers-coquillages (Rollers and Sea Shells). 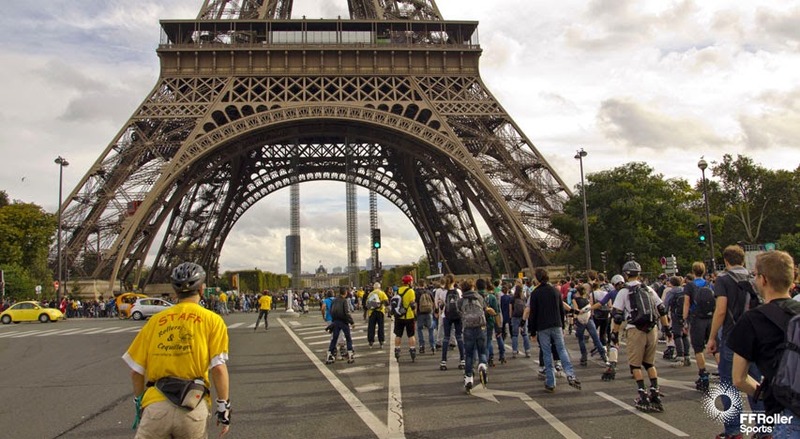 Every Sunday a route of 20 km in the streets of Paris is organized. Formations for the beginners, the more experimented skaters and the sprinters are also provided. Often I have observed on the Seine riverbanks demonstrations of skilled skaters. Those skaters must lead the parade on Sundays of Rollers-coquillages. I hope the whole crowd will pass again under my windows. A real treat for the eye. A big peaceful sportive and noiseless parade! How cool that you got to see Nympheas in person. I just watched a gardening program where the host went to Giverny and to see the painting. I love Carol Magne's embroidery and Deneth's colourful clothing.